Select apricots that are firm to the touch and plump in appearance. The flesh of the fruit should yield slightly, to gentle pressure but should not be mushy. They should have a bright, ripe scent. The coloring ranges from deep orange to a yellow/orange. Sometimes there will also be a tinge of a rosey red color and that is fine. Choose an apricot with no green color to it. 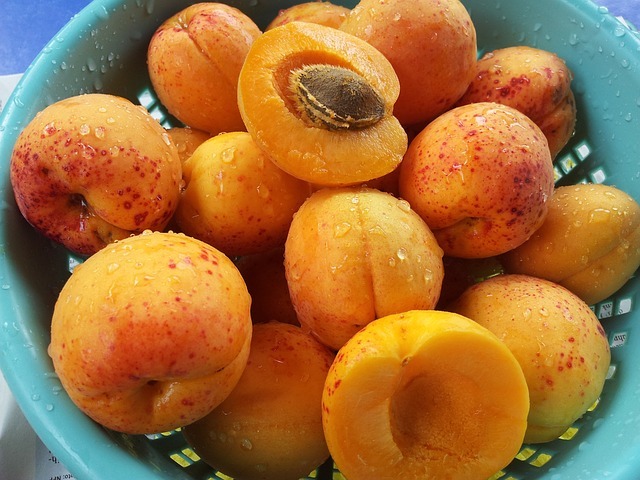 Apricots bruise easily so select fruits with unblemished skins. Ripe apricots should be stored in a sealed container or untied plastic bag in the refrigerator for up to one week. Once they have been refrigerated, apricots will not ripen further. To freeze an apricot cut it in half, remove the pit, dip each half in lime or lemon juice to prevent discoloration, peel and slice if desired and place in an airtight plastic bag or container in the freezer. Some varieties of apricot tend to become tough when frozen. To prevent this, blanch the fruit in boiling water for ½ – 1 minute, cool in cold water, drain and freeze. Apricots can also be frozen in syrup or sugar. Apricots that have any green to them have been picked too early and will not fully ripen properly. Apricots that are hard and orange will continue to get softer and juicier. Apricots should not be refrigerated until they are ripe, they will not ripen in a cold refrigerator. 1. Store apricots on a flat surface at room temperature leaving space between them and turning them regularly to ripen evenly.